Do you know if stollers like this can be taken on trains? I've talked with the NS operator via chat but was told they are not sure it would fit through the door. Has anyone of you ever taken it on trains and know it fits for sure through the door? It would eventually be in the Northen part of Holland, specifically from Volendam to Haarlem. I think something got lost in translation between Dutch and English. What you want to take on the train is a bicycle trailer (in Dutch "fietsaanhanger) and not a stroller. Fietsaanhangers are not permitted on trains. Strollers can be taken on public transport. A type of stroller is a buggy for small children. Those can be taken on public transport without any problem. 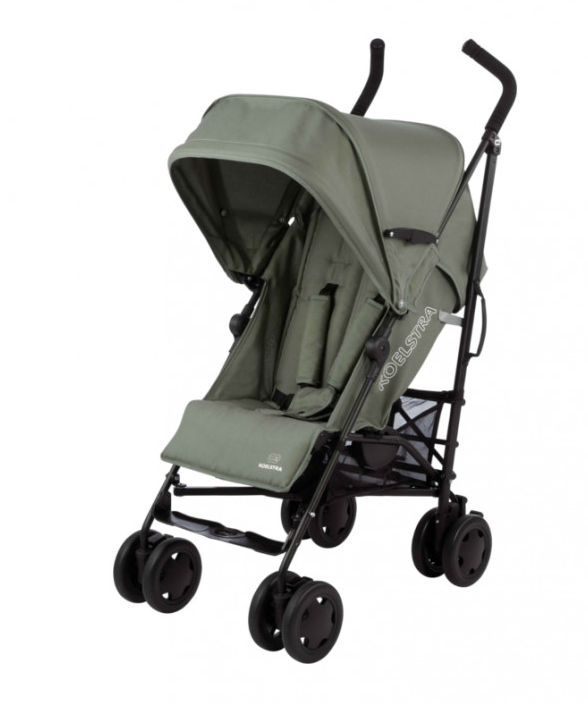 Here's an example of a "wandelwagen" or "buggy", in English a "stroller". Another problem could be that Volendam is not connected by train, only by bus. You can't take a bicycle on buses in NL. The nearest train station for Volendam is Purmerend, about 10 km from Volendam by bicycle. Maybe a moderator could change the subject of this topic from "stroller" to "stroller/bike trailer" to avoid further confusion. The maximum size allowed for luggage is 85 x 85 x 85 cm, so it could be too big. The webshop doesn't specify the size. "Strollers and pushchairs are also permitted at all times. This applies to the Intercity Direct trains too, as long as they are not larger than 120 cm x 90 cm". I was just curious if someone ever took this kind of stroller or saw one on trains. thank for your answer. I actually meant a "fietsaanhanger", since we are renting bikes and asked for a trailer that doubles as stroller. I was wondering if you could take one on trains, once detacched from the bicycle. Now I know it's not possible, thanks for all the info, also on connections to/from Volendam. I see what you mean now. A trailer that doubles as a stroller is an interesting concept. However, since it doesn't look like the trailer is collapsable, you won't be able to take the trailer on the train. It's simply too bulky. Regular strollers are never a problem because they can be folded away and then put on a luggage rack in a compartment of the train. Fietsaanhangers are generally foldable, particularly the one on that web link. The wheels are clicked off and the whole thing folds. It fits in the trunk of a car. The result is the same as a folded kinderwagen. Neverheless, it still is a bulky thing. Don't transport it during rush hour. If it really folds into a neat package I don't see why you can't take it on the train. Just make sure that it's folded before the train arrives and take it on the train as folded package. I couldn't make out from the pictures that it was collapsible. Good afternoon silvia.giacomini and welcome to the NS Community! Even though the last two replies from Ferdinand Delasoie and iMark make a good point, I'm afraid it's a risk you would be taking, as I cannot guarantee a successful access. As iMark mentioned earlier, a bicycle trailer is not permitted to be taken in the train. Even in a folded state, a conductor might refuse you access, to which he or she has the full right. Anything that folds to less than 85×85 cm (floor space) is considered hand/cabin luggage and can be taken on a train free of charge! Officially it's 85 cm in any dimension but e.g. an ironing board is no problem when stored upright. For a (non-folding) bicycle, a € 6,90 day pass is needed. Thank you all for your contributions. I will first of all check with the rental company that the trailer/stroller is actually foldable. I take knowledge that the conductor might refuse the access, thank you for making it clear. We would only be taking trains in case of heavy rainfalls, I hope it won't be the case in August.